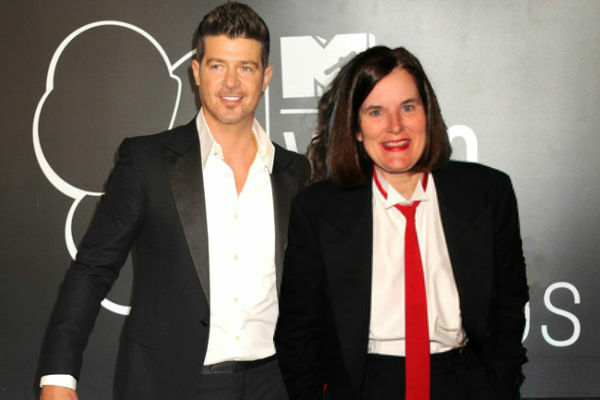 July 20, 2015 – Singer-songwriter Robin Thicke, who recently came to terms with the inappropriateness of his public appeals to his ex-wife actress Paula Patton, announced Monday that, as a means of moving past his obsession, he would instead be marrying comedian Paula Poundstone next spring. While Ms. Patton could not be reached for comment, the soon-to-be Mrs. Thicke was frantically ecstatic in her own announcement to the press, saying that she, the 55-year-old writer and radio personality, had actually been expecting a call from the 38-year-old R&B rich kid any day when she received it last week. “I know it seems sudden, and a little out of character for me, but even after the Blurred Lines settlement, a more relaxed, seven-figure lifestyle is something I could really get behind. Plus the guy's such a hilarious trainwreck, there's no shortage of potential stand-up material. The wedding, which both parties assured interviewers would be a quiet affair resplendent with hair gel and neckties, will likely take place in April, after Poundstone returns from touring the country, and Thicke has had time to record his new album, Paula as in Poundstone Because I'm Totally Over the Other One.